Dr. JITHESH KODOTH BDS, MDS. Assistant Professor Department of Orthodontics and Dentofacial, Orthopedics, K.V.G. Dental College, Sullia. Karnataka, India. Dr. ANIL KUMAR BDS, MDS.Assistant Professor Department of Orthodontics and Dentofacial, Orthopedics, K.V.G. Dental College, Sullia. Karnataka, India. Dr. AKRAM ANSARI BDS, MDS.Assistant Professor Department of Orthodontics and Dentofacial, Orthopedics, TMDCRC moradabad dental college, India. Dr. ABHINAY SORAKE BDS, MDS.Assistant Professor Department of Orthodontics and Dentofacial, Orthopedics, K.V.G. Dental College, Sullia. Karnataka, India. KODOTH ,J., KUMAR A., ANSARI,A., SORAKE,A., Orthodontic management of impacted maxillary central incisor with dilacerated root - a case report.."
The central incisor is the most frequently retained incisor (1). The frequency of maxillary incisor impaction ranges from 0.06% to 0.2% (2). The most common causes of impaction seem to be odontoma, supernumerary teeth, and loss of space. Impactions caused by disturbances in the eruption path related to crowding are somewhat less common (3). Other causes are crown or root malformation of permanent incisors due to trauma transmitted from the primary predecessors and apical follicular cysts that prevent normal eruption. Dilaceration of a maxillary incisor has long been a challenge to clinicians. Dilaceration in either primary or permanent maxillary incisors is associated with dental trauma at a young age, pathoses from a primary predecessor or simply abnormal position of the tooth germ. The involved incisor may present with angulation in the crown or root portion of the tooth. The most complicated situation is root dilacerations with the crown in an inverted direction; thus, the tooth always is impacted (4-8). A female patient 23 yr old visited dental hospital with the chief complaint of missing tooth in upper right front tooth region with the history of extracted deciduous tooth. She had no history of medical or dental trauma and her medical history showed no contraindications to orthodontic treatment. Intraoral examination showed an Angle Class I molar relationship, Class I canine relationship, missing upper right central incisor, spacing in upper and lower arch, 3 mm of overjet, and normal overbite. Cephalometric analysis revealed a skeletal Class II pattern. The panoramic radiograph demonstrated impacted maxillary right central incisor with dilacerated root which is rotated mesiolabially and distolingually. Maintain class I molar and canine relationship. Extraction is the most common treatment for a dilacerated maxillary incisor9-14. If the extraction option is chosen, the space can be closed orthodontically or replaced with a fixed prosthesis. Surgical exposure of impacted central incisor and alignment of the impacted incisor into the arch by orthodontic treatment and closure of spacing in upper and lower arch. Maxillary dental arch was bonded using 0.022" x 0.028" slot MBT bracket and 0.016" round niti arch wire was placed. Later 0.016" round niti arch wire was replaced by 0.016"×0.022" rectangular niti arch wire followed by 0.019"×0.025" rectangular niti arch wire and 0.019"×0.025" rectangular stainless steel arch wire. Surgical exposure (open method) of impacted central incisor was done and beggs bracket was bonded on the labial surface of the exposed tooth. Orthodontic traction was started using elastic thread and later 0.016" round niti piggy back was given. Lower arch bonding was done. Impacted incisor was aligned into the arch and to prevent the contact of root with cortical plate torquing auxillary was given. Final finishing and detailing was done. The maxillary right central incisor was brought into an acceptable position with normal overbite, overjet, and intercuspation. Spaces in upper and lower arch were closed. Well-interdigitated Class I canine and molar relationships were attained. Impaction of maxillary anterior teeth can be a challenging orthodontic problem. Several reports have indicated an impacted tooth can be brought into proper alignment in the dental arch9, 13, 15, 16. The following factors are used to determine whether successful alignment of an impacted tooth can take place: (1) the position and direction of the impacted tooth, (2) the degree of root completion, (3) the degree of dilacerations, and (4) the presence of space for the impacted tooth17. The treatment approach of impacted maxillary teeth requires the cooperation of dental specialties such as orthodontics, oral surgery, and prosthodontics18. This case demonstrated that surgical exposure and orthodontic correction might be a better treatment option than conventional extraction or the surgical approach for treatment of a dilacerated incisor. Surgical exposure and orthodontic correction offers a simplified treatment for dilacerated incisors. The advantages include immediate esthetic improvement; use of a single, simplified surgical procedure; simple and short orthodontic therapy; normal gingival margins. Langowska-Adamczyk H, Karmanska B. Similar locations of impacted and supernumerary teeth in monozygotic twins: a report of 2 cases. Am J Orthod Dentofacial Orthop 2001; 119: 67. 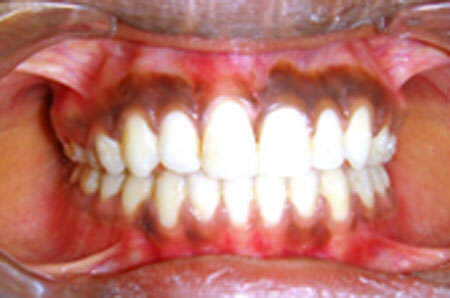 Grover PS, Lorton L. The incidence of unerupted permanent teeth and related clinical cases. Oral Surg Oral Med Oral Pathol 1985; 59: 420. Koch H, Schwartz O, Klausen B. Indications for surgical removal of supernumerary teeth in the premaxilla. Int J Oral Maxillofac Surg 1986; 15: 273. Andreasen JO, Petersen JK, Laskin DM. Textbook and color atlas of tooth impactions. Copenhagen, Denmark: Munksgaard; 1997:113-24. Smith DM, Winter GB. Root dilaceration of maxillary incisors. Br Dent J 1981;150:125-7. Stewart DJ. Dilacerated unerupted maxillary central incisors. Br Dent J 1978;145:229-33. Andreasen JO, Sundstrom B, Rava JJ. The effect of traumatic injuries to primary teeth on their permanent successors. Scand J Dent Res 1971;79(pt 2):219-33. Diab M, elBadrawy HE. 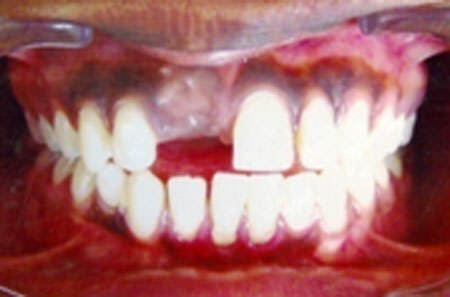 Intrusion injuries of primary incisors: effects on the permanent successors. Quintessence Int 2000(pt 3); 31:377-84. Kolokithas G, Karakasis D. Orthodontic movement of dilacerated maxillary central incisor. Am J Orthod 1979;76:310-5. Davies PH, Lewis DH. Dilaceration: a surgical/orthodontic solution. Br Dent J 1984; 156: 16-8. Greenfield RL. Case report: uprighting an inverted maxillary incisor. J Clin Orthod 1990;24:413-6. Crawford LB. Impacted maxillary central incisor in mixed dentition treatment. Am J Orthod Dentofacial Orthop 1997;112:1-7. Lin YT. Treatment of an impacted dilacerated maxillary central incisor. Am J Orthod Dentofacial Orthop 1999;115:406-9. Noar JH, Gaukroger MJ. Customized metal coping for elastic traction of an ectopic maxillary central incisor. J Clin Orthod 2000;34:585-9. Wasserstein A, Tzur B, Brezniak N. Incomplete canine transposition and maxillary central incisor impaction a case report. Am J Orthod Dentofacial Orthop. 1997; 111: 635. Tanaka E, Watanabe M, Nagaoka K, Yamaguchi K, Tanne K. Orthodontic traction of an impacted maxillary central incisor. J Clin Orthod. 2001; 35: 375. Uematsu S, Uematsu T, Furusawa K, Deguchi T, Kurihara S. Orthodontic treatment of an impacted dilacerated maxillary central incisor combined with surgical exposure and apicoectomy. Angle Orthod 2004; 74: 132. Bayram M, Özer M, S¸ener I. Bilaterally Impacted Maxillary Central Incisors: Surgical Exposure and Orthodontic Treatment: A Case Report. J Contemp Dent Pract. 2006; 4:098-105.